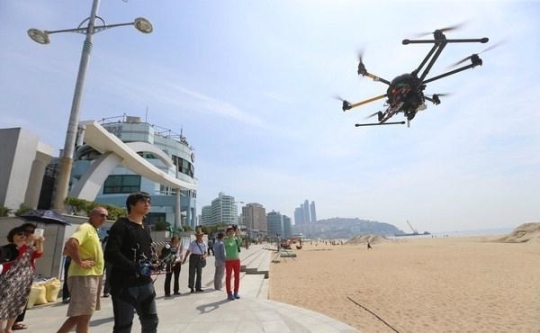 Drone aircraft will begin safety monitoring on the Haeundae Beach of Busan city this summer. Busan city is hoping to use drones to save lives using two unmanned drone during peak season. Two drones will begin to test-operate starting from middle of next month. Lifeguards are using the equipment to rescue swimmers. The drones are controlled from the beach. Busan city is planning to attach float on the bottom of the drone as well as on-board full HD monitoring camera so that they can drop a float to swimmers quickly, as the lifeguard swims to the rescue.